In 2012 Burt Rutan, the aircraft designer, posted these slides summarizing his take on global warming/climate change. 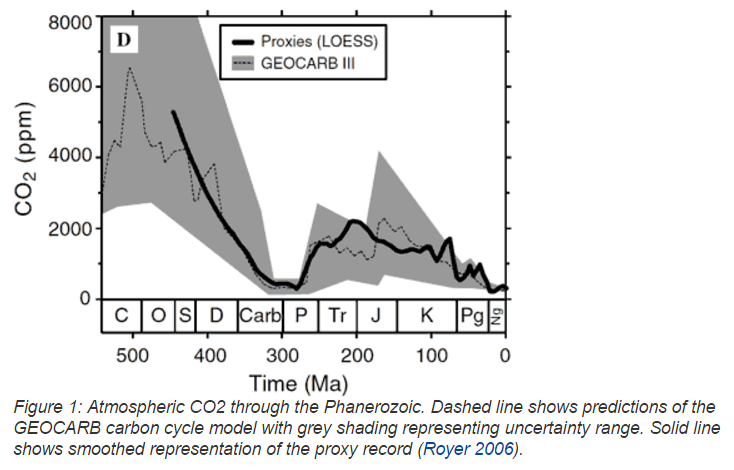 Calculated paleolevels of atmospheric CO2 from the GEOCARB III model, which models the carbon cycle on long time scales (here a 30 million year resolution). The long term carbon cycle is primarily geochemical, a result of the exchange of carbon between the atmosphere and rocks. The third revision includes improvements in the modeling of factors affecting CO2 uptake by continental weathering. So, at 30 million year resolution, there was never a time where CO2 concentration was as low as it is now. This data seems to contradict the scientific consensus on man-made climate change. This is false. Never until now have fossil fuels been selectively extracted and burned, producing carbon dioxide. 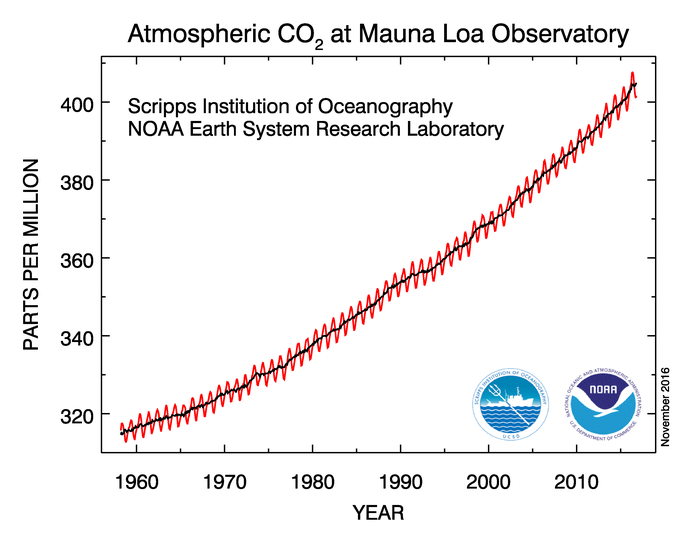 It is simply the truth that atmospheric CO2 concentration has increased dramatically and at an increasing rate since we have started measuring it directly. 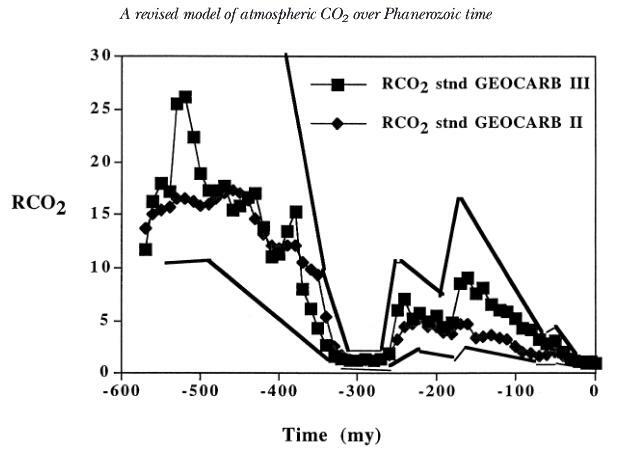 They reproduce a figure (from another paper) which includes the GEOCARB III figures with uncertainty, so we can see the basic numbers being shared by Rutan are consistent with the GEOCARB III model. However, the Skeptical Science FAQ article above goes on to put those figures in context, so we can see that this data does not contradict the scientific consensus on man-made climate change. It explains that CO2 levels are not the only driver of climate, and that the Sun's output was about 4% lower, that the data for the late Ordovician (450 million years ago) is limited and may be misleading. So Burt Rhutan's data is accurate, but his conclusions ignore other known facts. Yes, according to Wikipedia, that particular claim is true (note summary table on the left, with citations), in the sense that there has been times in Earth's history when CO2 levels and temperatures have been much higher than modern times. The lack of citations makes it very hard to say if his graph is correct. However, I must point out that this does not refute climate change. It actually establishes a strong link between CO2 levels and temperatures which is exactly what's driving climate change. For example, during the Cambrian period, sea levels were significantly higher, which is one of the main problems people claim climate change is causing. The East Antarctic ice sheet (the major Antarctic ice sheet with ice up to 15,000 feet thick) first appeared in the Miocene, 15 million years ago. Throughout most of the Antarctic ice sheet history, global CO2 levels were 1000-2000 ppm (compared to present 400 ppm), so the recent minuscule rise of CO2 is peanuts compared to what it has been. So even doubling, tripling, quadrupling, or quintupling of CO2 would still be well below the levels of most of the ice sheet’s history and the ice sheet survived those quite nicely. 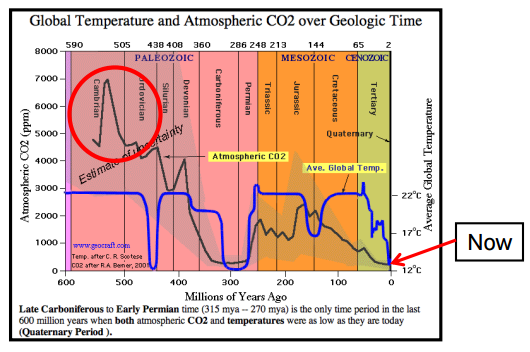 CO2 was higher in the past "The killer proof that CO2 does not drive climate is to be found during the Ordovician- Silurian and the Jurassic-Cretaceous periods when CO2 levels were greater than 4000 ppmv (parts per million by volume) and about 2000 ppmv respectively. If the IPCC theory is correct there should have been runaway greenhouse induced global warming during these periods but instead there was glaciation." ...>Atmospheric CO2 levels have reached spectacular values in the deep past, possibly topping over 5000 ppm in the late Ordovician around 440 million years ago. However, solar activity also falls as you go further back. In the early Phanerozoic, solar output was about 4% less than current levels. The combined net effect from CO2 and solar variations are shown in Figure 2. Periods of geographically widespread ice are indicated by shaded areas. The Scripps University Geoscience Research Division has similar results still: Link, see chart on the right which benefit from having margins of error. 500 million years ago the Earth experienced significantly more carbon dioxide versus the 400 ppm or so today. Are the leaked Heartland Institute documents legitimate? Has the climate not warmed in 17 years?